Dr. Bartakke is board certified in internal medicine and geriatric medicine and is fellowship trained in endocrinology and metabolism. She completed her training at the University of Tennessee in Memphis. 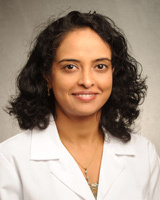 Dr. Bartakke completed her residency internal medicine at Wright State University in Dayton, Ohio and received her Medical degree from Bangalore Medical College in India. As an endocrinologist, Dr. Bartakke works with patients who have diabetes, thyroid and pituitary problems, osteoporosis, and endocrine cancer. Her goal is to help patients focus on early intervention and treatments, while educating with patients throughout the process.